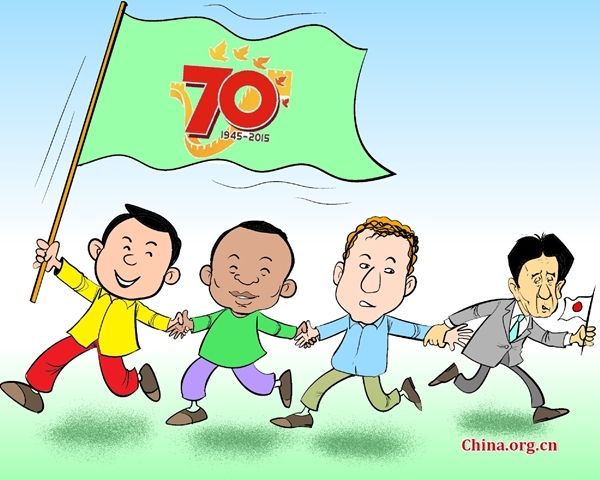 As Tian'anmen Square gets ready to mark 70 years since the end of the Chinese People's War of Resistance Against Japanese Aggression and the World Anti-Fascist War, the victory parade is drawing unprecedented global attention. Particularly in India, the much awaited event has been picked up by a noisy press and social media, as well as the strategic communities. Recently, not a single day has passed without some story or other on the upcoming. The V Day celebration which will be attended by the U.N. Secretary-General Ban Ki-moon, Russian President Vladimir Putin, South Korean President Park Geun-hye and 30 other world leaders has generated plenty of interest even among the general public who otherwise would have little memory of China's valiant role in the defeat of fascist forces. What is revealing is that without V Day commemoration parade, many people from this part of the world would have little knowledge of the critical role and supreme sacrifices that China made to ensure Asia could be free and secure from the fascist threat. Very few people remember that over 20 million Chinese died fighting the fascist forces in different war theatres, whereas the Soviet Union lost 27 million people while fighting Nazi Germany. Chinese, who endured the onslaught of Japanese aggression in the initial years with massive casualties, did help turn the war tide in favour of the allied forces. While Japanese forces were able to make advances and capture cities such as Shanghai and Nanjing, the Chinese valiantly resisted their forward movement in countryside and making them suffer grievously in terms of manpower and resources. Let us not be searching for deep political meaning in a celebration that is deeply ceremonial and serves public interests through its larger message of peace and freedom.